ZAYAM, AZERBAIJAN. 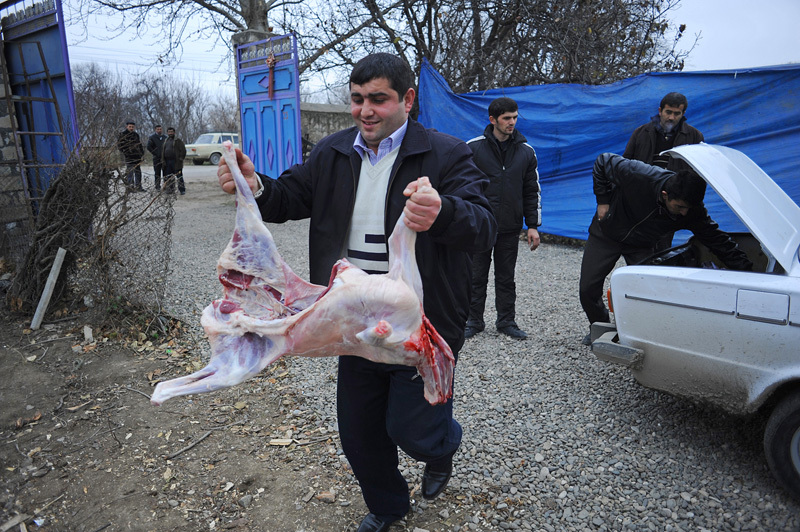 A man takes a lamb carcass from the trunk of a car for butchering before cooking for women mourners during the seven day ceremony, part of Azerbaijan's elaborate funeral rituals that include gender segregated commemorations of the deceased three days, seven days and 40 days after their death in Zayam, Shamkir Region, Azerbaijan, approximately four kilometers from the BTC pipeline, on January 3, 2012. Compensation funds for land traversed by the BTC pipeline paid to the family of the deceased as a result of disruption stemming from the period of the pipeline's construction totaled under $1,000 and went to keeping the deceased healthy and caring for her daughter who suffers from tuberculosis.